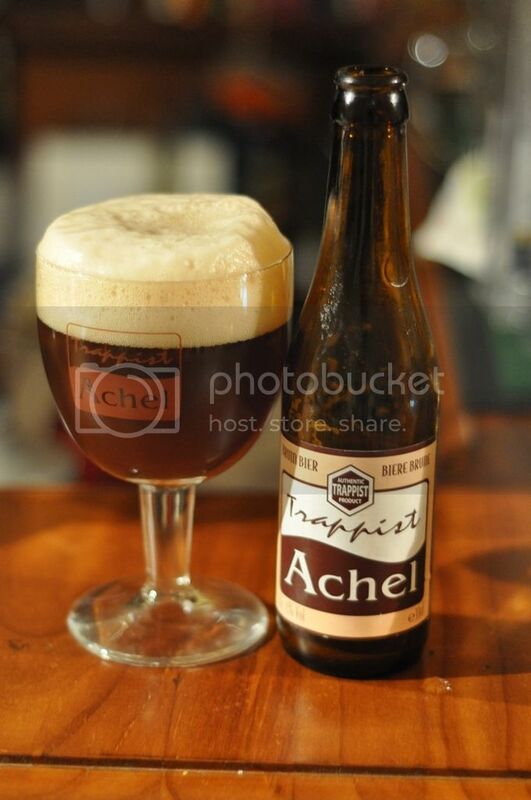 Achel is the fourth Trappist beer that I will be trying for this challenge. This brewery has one of the better stories I've ever heard. The monastery has been dismantled a few time due to firstly the French Revolution and then secondly World War II, when the German's stripped the brewery for copper. Brouwerij der Sint-Benedictusabdij de Achelse Kluis to give the brewery it's full name, was officially re-opened in 1998 after a long re-build. The brewery produces 6 beers of which only 2 can be bought outside of the abbey. This is the dubbel, an 8% brown beer, it's a good style and should be a nice warming beer. I'm looking forward to this one. This beer has significantly more head than any other Trappist beer I've ever had. The head is a tan colour and seems rather well aerated. Colourwise it looks excellent! The colour is a dark amber and looks rather appealing. There doesn't appear to be much carbonation but nor would I expect that in a trappist ale. It's a very good looking beer for the style. This tastes delicious! The first thing that really strikes me about this beer is that there is a mild spicing to this beer that was not detectable on the nose. Cloves seem to be the most notable of these and the merge very nicely with strong caramel malts. The dark fruits of which maybe figs are the prominent flavour all seem ripe and fresh, and add a tartness to this beer. The beer is (like all trappist beers) brilliantly put together, it's an absolutely terrific beer! In my mind this is the easiest drinking of the Trappist beers, that I've had so far. The body is thinner than one would expect from a dark beer and the low carbonation makes it very drinkable. An excellent flavour that should appeal to all and the cheapest price of all of the trappist beer, make this the trappist beer I would recommend people try first if they are interested in trying trappist beers. This is also really good for beer lovers, go out and get yourselves some of these; it's a fantastic ale!